The spring season has come to an end for bigwall climbing in Yosemite Valley. I finally got to do the Nose on El Capitan, which is arguably the most famous rock climb in the world. Fortunately, it was every bit as good as its reputation. In many ways it reminded me of the Heckmaier route on the north face of the Eiger by being a complex route up the longest part of the wall with lots of historic pitches, although the former is a pure mixed climb whereas the Nose is a pure rock climb. There are several interesting pendulums on the Nose, which makes for a fairly committing feeling on the route. Especially the King Swing was intimidating and it required complete trust in the ropes and climbing gear. I’m grateful that I once again got sponsorship from Scanlico who provided me with ropes from Beal and climbing gear from Petzl. In particular I would highly recommend the Apollo rope, which is 11 mm thick and really inspires confidence when rappelling and jumaring on an exposed bigwall route. The new Petzl Ascension jumars are also worth mentioning because they have been significantly improved and are now both light and easy to handle. They slide very well on the rope and it is possible to temporally disengage the teeth when moving the Ascension up a rope that is not weighted, which makes it a lot easier to use than the previous version. Another piece of critical climbing gear on a bigwall is the Grigri, which makes it a lot safer to belay pitches that take a long time to lead because you don’t have to watch the climber as closely as with a normal belay device. If I need to let go of the rope to eat or to send up more gear on the tag line I still need to tie a knot about a meter away from the device just to be completely safe, but the Grigri greatly reduces the stress of belaying because of the automatic blocking mechanism. Below are some of my favourite photos from this climbing season. My blog wasn’t updated recently, because I haven’t been in the mountains for a while. 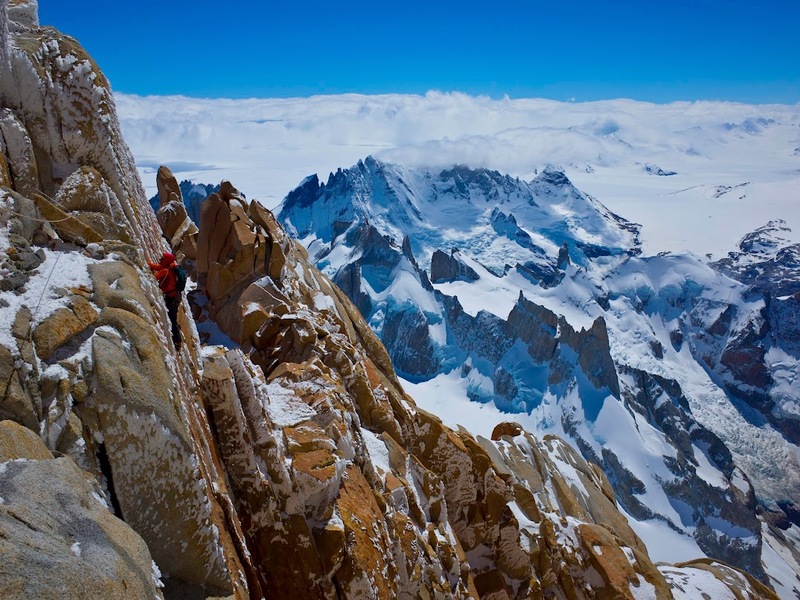 Since I climbed Fitz Roy a lot has changed in my life. First I moved to California to pursue research at Stanford University, which is obviously very time-consuming. On top of that I became a father and need to spend as much time with my wife and son as I can, when I’m not working. However, I live a short drive from the granite walls of Yosemite National Park, so my focus in climbing has naturally shifted from mountains to big walls. From April 5th to 7th Ben Erdmann, Jess Roskelley and I climbed a new route on the Citadel in the Kichatna Range, Alaska. You can find a slide show from the trip HERE. Our new line follows a series of ice runnels to the left of the ‘Supa Dupa Couloir’ established in 2003 by Mike ‘Twid’ Turner, Stu McAleese and Olly Sanders. Our initial plan was simply to repeat the ‘Supa Dupa’. However, Twid mentioned the possibility of a potential new line to the left of it when we e-mailed him about beta for the Kichatnas. Paul Roderick of Talkeetna Air Taxi dropped us off at the base of the east face of the Citadel around noon on April 4th and after a quick inspection of the route we were convinced that we should go all in on the line to the left of ‘Supa Dupa’. We began the climb just after midnight less than 12 hours after landing on the glacier. Initial snow and ice pitches in the couloir led up to a very steep corner with difficulties of AI5+ and M6+. Jess was the ropegun on these pitches. At sunset we chopped a ledge on a 60 degree ice slope and suffered through a sitting bivy in the cold Alaskan night. We had brought a small tent, but it did not fit our ledge and collapsed on us during the night. Early the next day we arrived at the col, which marks the end of the couloir. From there Ben led several pure rock pitches on the relatively warm south ridge. The first pitch off the col was steep A3. 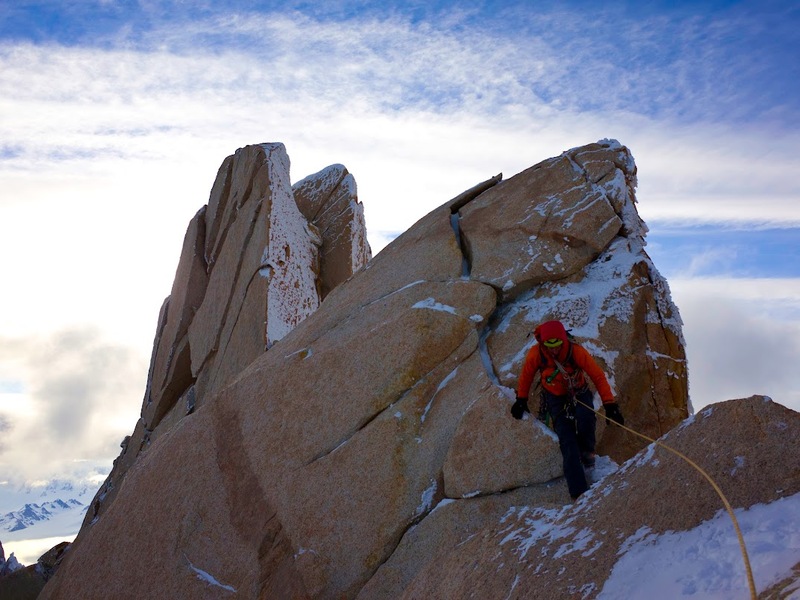 He then climbed the 5.10R crux without gloves and crampons, which was a full 60 meter pitch. We reached the summit ridge that evening, but bivied only a stones through from the actual summit on the east side of the ridge. We once again settled in for a sitting bivy on a chopped ice ledge. After a very uncomfortable night we rappelled down a gap on the west face, which took us to an easy snow ramp that lead directly to the summit. The summit itself consisted of two large granite blocks about five meters high, which from a distance looked unclimbable. Fortunately there was an easy way up on their back side. After a short brew stop, we then faced an arduous descent down the north ridge where our rappel lines got stuck several time, and we had lots of exposed down climbing and also had to rappel off our only two snowstakes. In the last rays of the sun we did one final rappel off a spectre-hook, which was hammered less than 3 cm into an icy crack, but even scarier it was flexing under bodyweight. However, it got us over the bergschrund with one meter of rope to spare and we reached the safety of the flat glacier terrain. We stumbled back into our base camp 70 hours after having left it. 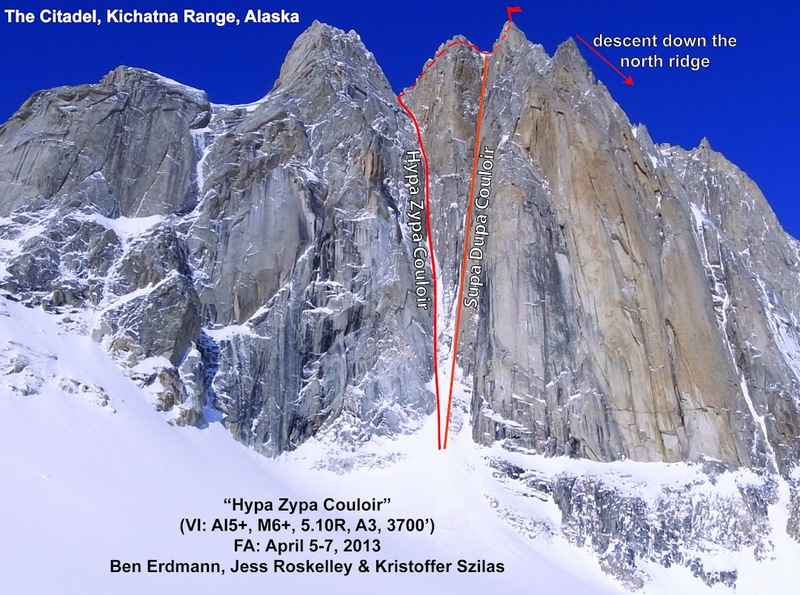 We jokingly named our new route the ‘Hypa Zypa Couloir’ in keeping with the name of the ‘Supa Dupa’. That way the Super and Hyper couloirs of the Kichatnas are located side by side unlike in the Alps. 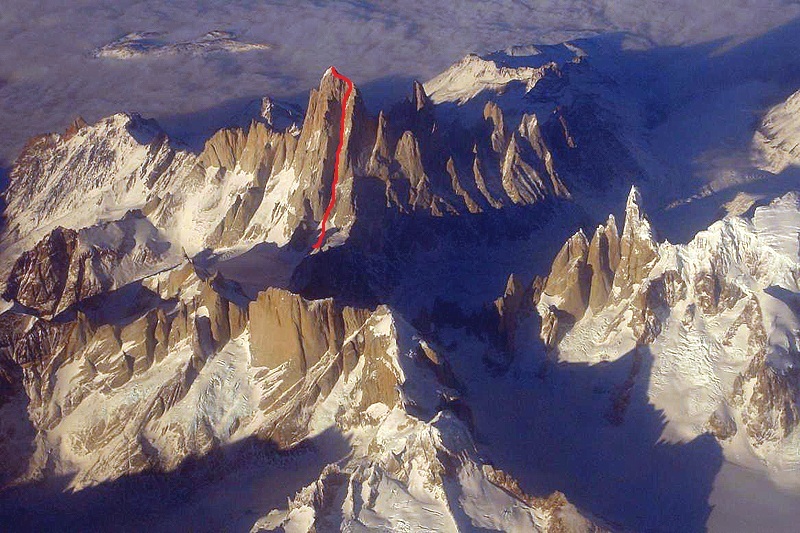 The overall difficulty of our route is American commitment grade VI (corresponding to European ‘ED+’) with technical pitches of AI5+, M6+, 5.10R, A3 and a vertical height of 3700 feet (ca. 1100 meters). For comparison the 'Supa Dupa Couloir' was given an overall grade of ED4 and the first ascentionists were able to rappel their line. We ruled out the option of descending our line at the col due to the very compact and featureless nature of the rock and the lack of good water ice for alabakov anchors. 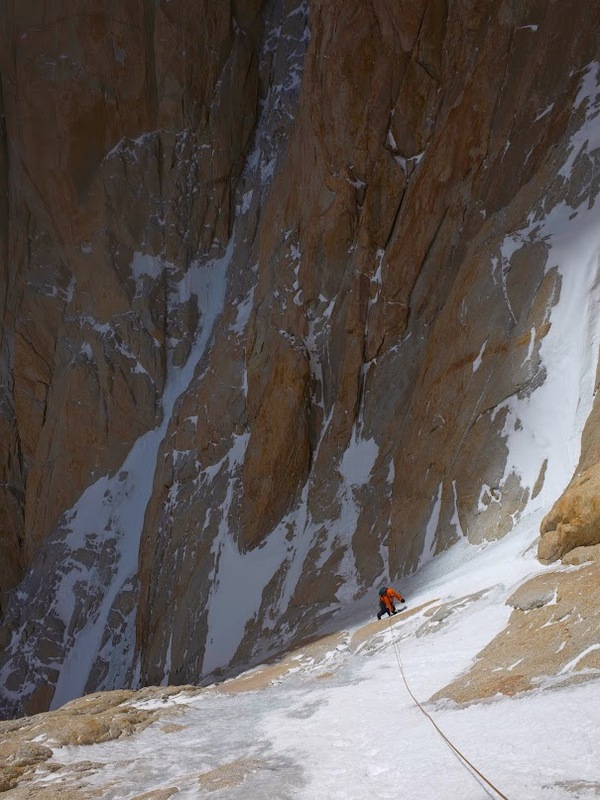 Therefore it would be an understatement to say that we were committed on the 'Hypa Zypa Couloir'. The ED-grade could be followed by any number as that system is not particularily well constrained, so the '+' is up to the second ascent team to define. 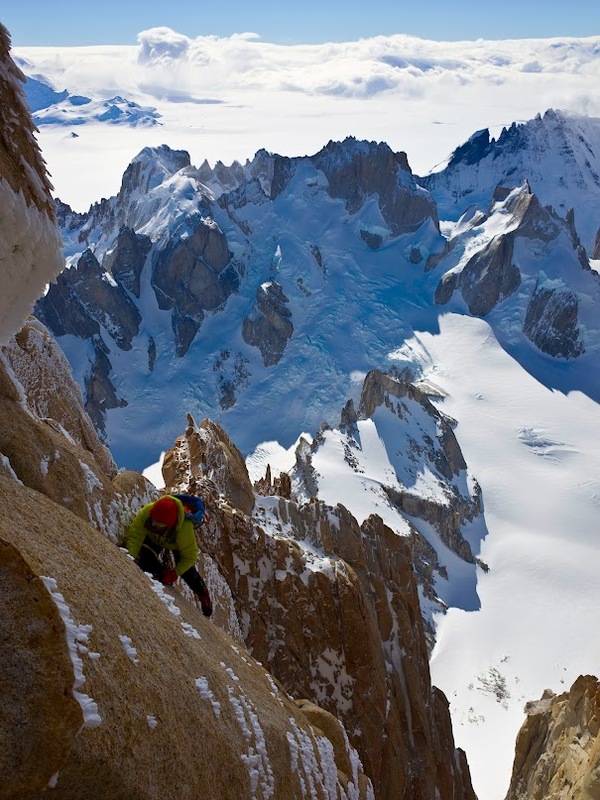 Jess Roskelly and I made a good attempt at climbing Exocet on Cerro Standhart in Patagonia, but bailed close to the top. High temps caused the crux chimney to flow with water and after spending nearly 2 hours in freezing cold water we were both dangerously hypothermic. We simply had to get out of there as fast as possible and get into the sun and put on some dry clothing. Unfortunately, the sun had moved over to the west side of the mountain by the time we got out of the chimney and our puff jackets were also drenched even through they had been in out packs the whole time. Being hypothermic and trying to rappel off a Patagonian peak is a bad combination and especially on a descent with lots of rock flakes as we experienced. Our ropes got stuck a few times, resulting in lots of prussiking and cursing. I dropped one of my ice tools, but couldn't care less at the time. Back on the glacier the warm weather had resulted in slushy conditions and I broke right through one of the snow bridges. Fortunately I had chosen a nice crevasse to fall into and only fell 4 metres, while other crevasses seemed almost bottomless. Overall we had a great adventure and will be back for more next year!